Construction on Donelson Plaza, which was begun in 1958 and completed in 1961, is being transformed into a ‘town center’ anchored by a new library branch. What’s old is soon to be new again. The year was 1958, and construction of Donelson Plaza was underway, a transformational project that would reshape a rural community less than 10 miles east of downtown Nashville. The Plaza opened its doors in 1961, ushering in an unprecedented wave of growth and boom times that made Donelson a thriving neighborhood destination. Thirty-something years later, in the late 1980s and early ’90s, Donelson Plaza underwent its first major refurbishment in a slowly shifting economic environment. In the ensuing years, however, anchor tenant Castner-Knott closed. Other stores followed. 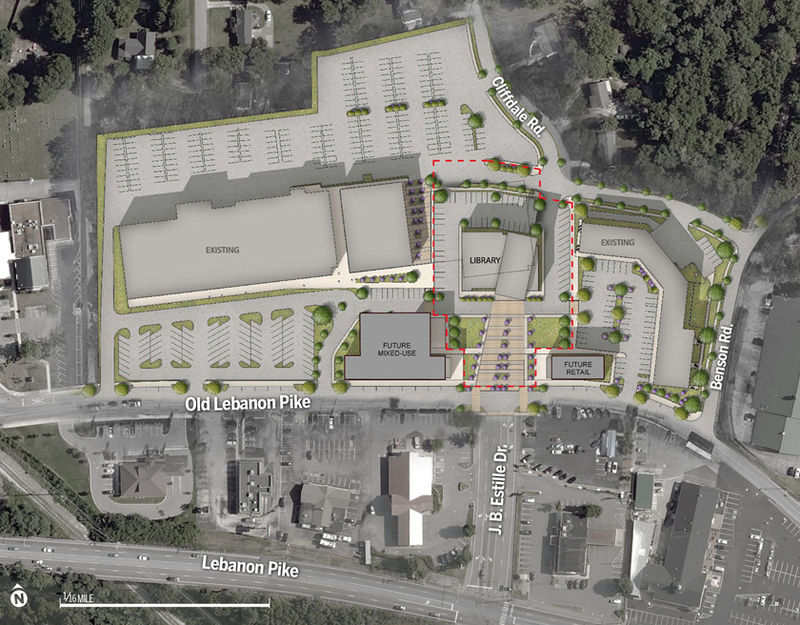 Today, another revitalization of Donelson Plaza has begun on Old Lebanon Road, a three-year project that will culminate with the addition of a “town center” atmosphere and a state-of-the-art public library. “On the wallpaper of my laptop is a shot of the Donelson Plaza being built in 1958, and that was when Donelson was going through that fundamental change from rural to suburban,” District 15 Councilman Jeff Syracuse says. “And so that’s a reminder to me of where we were, where we are, and where we’re going. We’re now taking that next step of natural growth, going from suburban to urban. “It will be an interesting transformation. I guess, technically, if you go back and look at the original Plaza, and how it got a little bit of a facelift in the late 1980s and early ’90s, and now here we are with the third generation of Donelson Plaza. 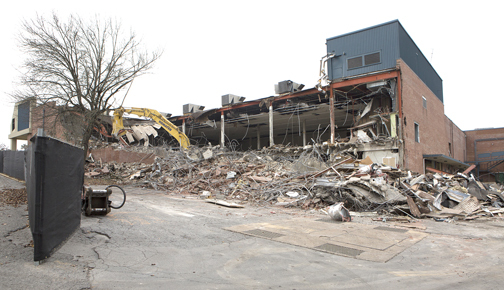 Demolition of the east end of the plaza – where the library will rise – began last week, and the project will include two new mixed-use and retail buildings, updated infrastructure, storm water drains, rerouting of a road and the addition of sidewalks. Cost of the library will total about $20 million, according to Syracuse, including more than $15 million for construction and $4 million for infrastructure. Donelson Plaza was certainly showing its age when purchased in 2016 for $7.8 million by Holladay Properties of South Bend, Indiana. Now, like many an aging Nashville star, it will be getting a much-needed facelift. “Holladay bought Donelson Plaza a few years ago with the goal of redeveloping and creating a new town center in the heart of Donelson,” says Allen Arender, partner and executive vice-president of development for the company’s Nashville office. Arender adds the Plaza’s modernization will include a new façade. Benton Smothers, Holladay’s vice-president for development, compares it to a good house-cleaning. Artist rendering of how the Donelson Plaza complex will look after completion. Cliffdale Road is being rerouted. One of the most anticipated – and essential – features of the project is the rerouting of Cliffdale Road. It bisects the Plaza property, with Plaza Two – a small, angular strip mall – separated from the main section known as Plaza One. The library site, recently purchased by Metro from Holladay for about $2.31 million, is right where Cliffdale Road exists. That road will be redirected behind the Plaza Two property, and library construction can begin once it is moved and infrastructure work is completed. Syracuse says ribbon-cutting for the new Donelson library branch could take place in late 2021 “if all goes well.” It will replace the current library about a mile away on Lebanon Pike which opened in 1966. “It’s the next generation of the heart of Donelson with a revitalized town center and a brand-new 21st century library,” Syracuse exudes. The oldest remaining tenant from the earliest days is Donelson Plaza Strike & Spare Family Fun Center, and the newest is Everyday Superhero Training, which opened on Dec. 1. Both businesses are on the back side of the Plaza, but accessible from the front, and the owners of both say they are excited about the future of Donelson Plaza. “I know they (Holladay) have plans for upgrading that center, which I welcome,” says Larry Schmittou, the former Nashville Sounds owner who now operates 14 bowling centers including – Donelson Plaza and Hermitage – in four states. Arender adds he doesn’t anticipate any changes in the current lineup of tenants, just adding more in the future when the new mixed-use and retail buildings are erected. Lydia and Julian Loomis are the owners of Everyday Superhero Training, which they describe as a “holistic and nerdy personal training studio” that includes role-playing exercises and group classes. Julian Loomis says he is “stoked” about the Plaza refurbishment. Several current tenants were moved from Plaza One to Plaza Two in preparation for the demolition of the east end of Plaza One where the library will be constructed. Rick Parham, owner of Rick’s Comic City, admits he had reservations at first about the move but has since come to love it. It’s a smaller store, but traffic has increased because he now has neighboring restaurants – Homegrown Taproom & Marketplace, Greek Deli and Pizza Factory – that are good draws. “When we moved, I was skeptical. But it’s been a really good move for us. Where we were, we didn’t have neighbors. So, we had nothing to feed off of,” Parham says. Holladay’s Smothers says that kind of feedback is welcome. “We had a great opportunity to move them a few spaces over to the other building and give them enhanced visibility and they both (along with Erika’s Tailoring) got a little bit more workable space. It was a good opportunity and they’re good tenants,” he adds. Like Schmittou, Parham hopes to maintain a long relationship – and lease – with the current owners. Parham says his first job was at a shoe store on the west end of the Plaza, and his comic store lease runs for five years. He’s especially excited to be next door to the library, anticipating a cross-over of readers. And so are Donelson residents. What is old will soon be new again.